Heat transfer plays a primary role in the design of electronics cooling and Heating, Ventilating, and Air Conditioning (HVAC) systems. Heat transfer also plays an important role in many other applications, such as gas turbines, heat exchangers, brakes, and even people. The flow of heat between hot and cold substances and objects in contact (e.g., a fluid and a solid) can be broken down into two distinct forms of convection. Forced convection is achieved by forcing a fluid to flow over a solid object and in so doing the fluid either transfers heat to the solid or absorbs heat from the solid. A good example of forced convection is in a desktop computer where fans force air over various heat-sinks in order to cool them. As an aside, heat sinks are another link in the transfer of heat, i.e., they conduct heat away from hot microchips via direct solid-to-solid contact. Natural convection relies on differences in fluid density (resulting in buoyancy forces) caused by temperature differences (gradients) to drive large-scale fluid motion. The effect of gravity acting on a fluid with different densities will cause the lighter (lower density) fluid to rise and the heavier (higher density) fluid to sink. A good example of a heat/buoyancy-driven motion is the rise of a hot-air balloon. The hotter the air, the lighter it is relative to the surrounding air, which causes the balloon to rise. Natural convection is used in many home heating systems. Hot water is pumped around the house in pipes (forced convection). The pipes are covered with cooling vanes to maximize the surface area in contact with the surrounding air. 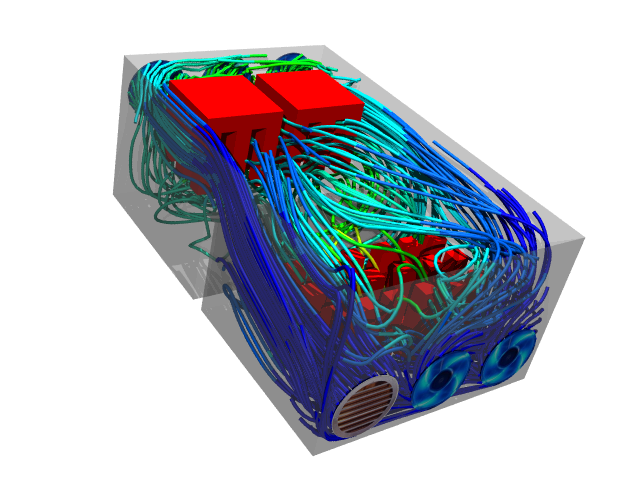 The air that touches the cooling vanes heats up and rises due to buoyancy. The hot air then transfers its heat to cooler surfaces (e.g., windows, walls, ceilings) causing it to cool and sink, which sets up a steady circular motion ready for the air to be reheated.